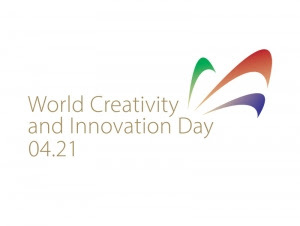 On April 21, 2018, the first official World Creativity and Innovation Day (#WCID) will be celebrated. It aims to encourage creative multidisciplinary thinking to help us achieve the sustainable future that we want. April 21, the day before Earth Day, April 22, was chosen as World Creativity and Innovation Day to emphasize the importance of using new thinking to create a decent life for all on a sustainable planet. During World Creativity and Innovation Day, April 21 (WCID) and Week April 15 – 21 (WCIW) individuals, families, teams, leaders, nations, organizations, students, and communities are acknowledged, informed, inspired and encouraged to use their creativity – to be open to and generate new ideas, to be open to and make new decisions and to be open to and take new actions – that make the world a better place and to make their place in the world better too. The World Creativity and Innovation Day (WCID) was included in 2017 by the United Nations as a Day of Observance. This was done to encourage people to use creativity in problem-solving to approach solving the 2030 Sustainable Development Goals. To understand how to access your creative abilities to generate new ideas, take new actions and achieve new outcomes. To make plans to start something new. It connects people all over the world to express their passions and express their gifts to make the world a better place and to make their place in the world better too. It help to open the door for many new conversations, connections, collaborations and community.